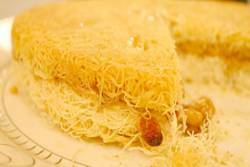 Kunafa is traditionally eaten during Ramadan in arab and middle-eastern countries. It is served during the non-fasting hours which is called Iftar, the time between sunset and break fast. 2. Preheat oven to 350 degrees F/180 degrees C. Butter a 12-inch round, 2-inch high cake pan. My mother makes a very light and simple version she learned from her Lebanese friend. Divide the kataifi on to 2 greased baking sheets; bake on moderately high until golden. Let cool completely. Whip some whipping cream. Spread over one sheet of Kataifi. Top with second sheet. Drizzle over sugar syrup that has been flavoured with a small amout of orange blossom water and a squeeze of lemon. Drizzle half over the top and keep remaining in a small pot for people who want to add more. Easy peasy, quick and deliciously light. it's the most fantastic dessert that i've ever tasted in my whole life!!!!! It was the most delicious dessert which I extremely loved and enjoyed to taste it ! I recently learned this recipe in Saudi Arabian cooking class...it is the yummiest thing I've ever eaten. I plan on making a big pan of it and taking in to my coworkers. OMG!! This is the best ever. Thanks so much! !I LOVE IT! My mom used to use sweet white cheese (queso blanco), however improvised over the years and used a variation that included ricotta and mozzarella, sweetened with a little sugar & vanilla. Kunafah, the best Arabic sweet! This was the first time for me to make Kunafah and I really loved it. I will now take it to my coworkers after the Eid holidays. Happy Eid to everyone. Mmmm. Knafeh is my favourite desert. It originates from Nablus in Palestine and till this day, its the Palestinians who make the best knafeh. And it is the Palestinian cheese (either the nabulsi or the akkawi) that makes the best knafeh. I am rating this 3 stars because the filling is not quite authenic. I ended up calling my grandma in Syria who got in touch with her friend, the local pastry shop chef and got a recipe for the filling that was just divine. No measurements though. Basically, you boil 1cup water and 1/2 cup sugar- then add 1/2 cup of finely ground semolina powder. Stir this until thickened, then add Akawi cheese or any other melting non salted cheese. Stir until the cheese is fully melted. Cool a little. Pour this filling between the layers of Kataifi but careful not to go to the edge or you will not be able to invert it. Proceed with the recipe as usual. Very easy and extremely simple yet decadent and delicious. I'm so confused! How much Kataifi do you mix in first? Then how much do you add in? Please give details!